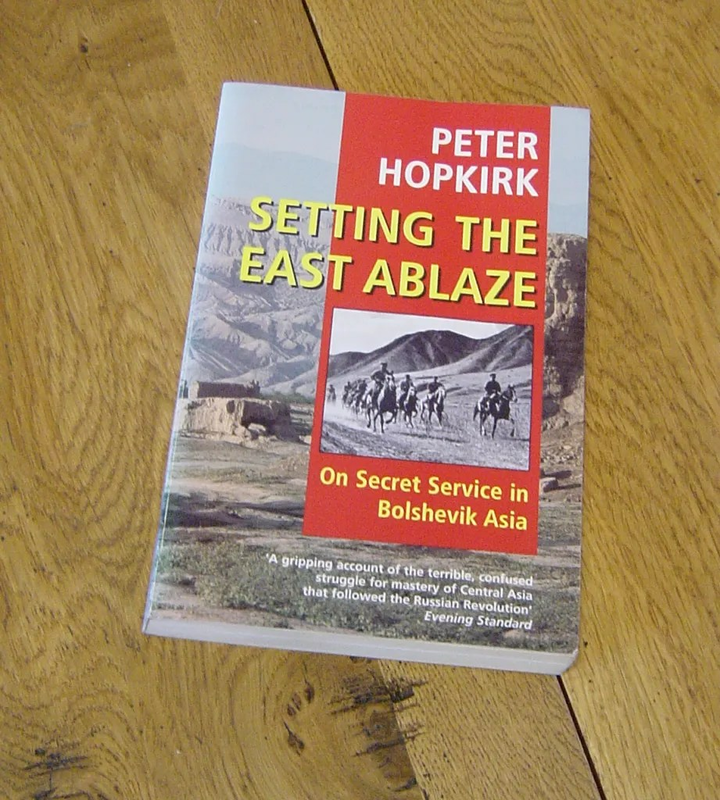 Like many BOB gamers I had to do a double take on hearing of a new book called “Setting the East Ablaze“, as many have got into BoB when Mark Copplestone and Chris Peers recommended reading Peter Hopkirk’s excellent book “Setting the East Ablaze”. 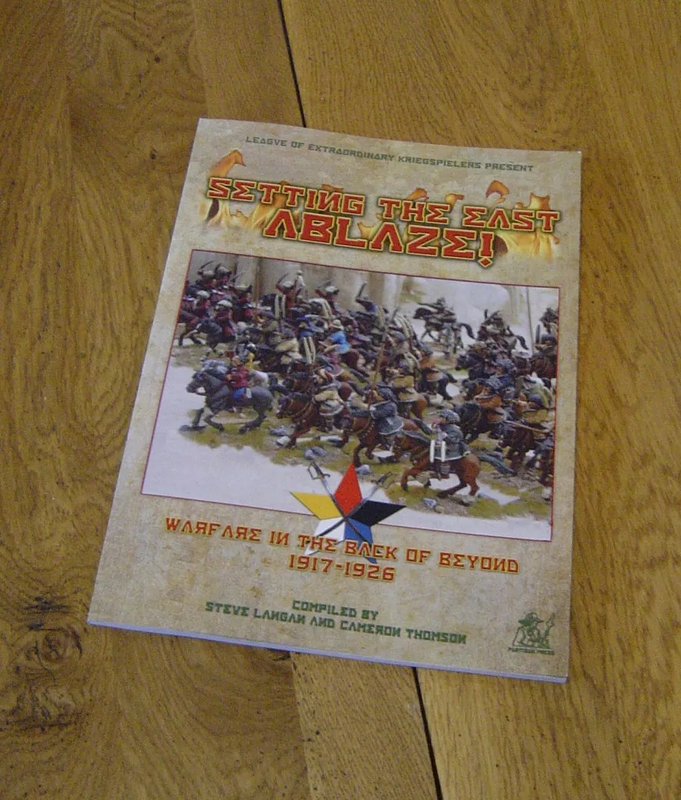 This is a new ruleset from Partizan Press available from Caliver Books. So always in search of the perfect rules set I went and ordered them. they are a professional full colour throughout, glossy set of rules, A4 size. They are obviously aimed at BoB, but could take on RCW and other post WW1 conflicts with some ease as is alluded to in the text and some of the photos of Colonial African adventures. 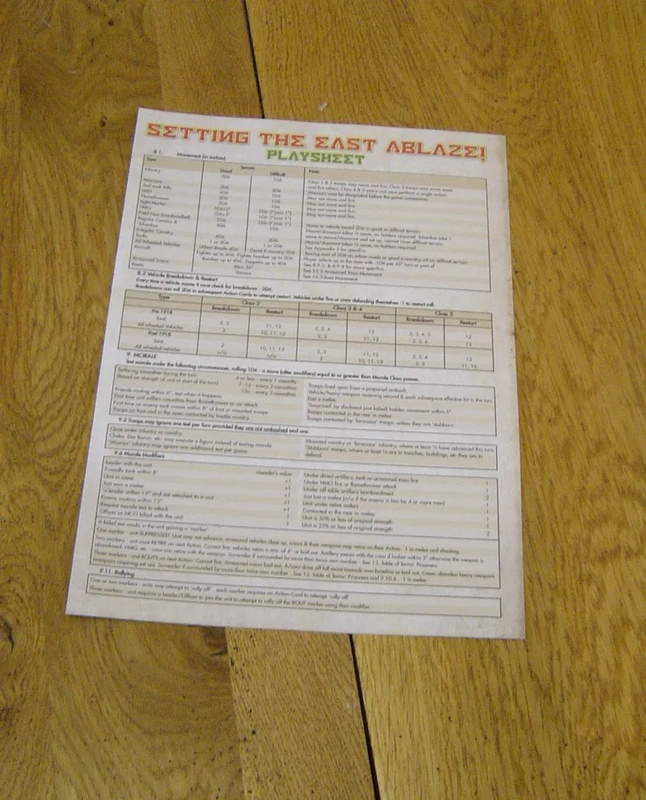 They come with a Playsheet, which is separate from the book and printed on thicker paper/thin card, which is always useful to have. The writers set out their aims on page 7, under “Principles”, where they clearly state what they’re aiming at achieving and as far asi can see they follow through non those principles ! This is perhaps something many games designers don’;t do – and I include myself here having tinkered with my own systems with various mates over the years. Take a step back and work out what you are trying to do, how you are going to do it and what the key principles are. If you don’t do this, then you end up with “mission creep” and a mish mash of rules ideas that seem good at the time and in isolation, but when brought together, make for an awful mess. The rules are clearly laid out in numbered paragraphs (hmm, good for referencing, good for clarity but a bit clunky in style). As they are almost bullet point in style, the rules seem easy to read and understand. My only comment here is that the Morale section seems out of place in terms of order of sequence of play. Activation of units is again determined by pulling cards – one card for each specific unit. What the unit can do is controlled by its Class (from 1 -5). There are suggested options for Event and Chance decks as well, which will go well with the more “Pulp” style of gaming. Movement is mostly random – as a matter of personal choice I don’t like this. I can see merits where it is difficult terrain, improvised or primitive vehicles but not for infantry. But again at least it is in a clear table so very easy to use. Ranges of weapons are quite short. Similarly the blast radius for most weapons is 1″ or 2″ only. Shooting in Ambush, Smoke, Fog and AA are also covered along with aircraft in general. Melee is fairly simple with the pursue rules clear cut and the “Table of Terror – Prisoners” equally ruthless. Trains and ships are also covered. There is eye candy throughout which is always welcome and I’ve got a few more ideas for conversion (my wallet is crying, again). There is a nice style of headings using faux-Cyrillic letters, which again reinforces the aim that this is for BoB/RCW. Appendix 1 briefly covers points values, but the basic assumption really is you should be making up fun scenarios. Appendix 2 has a good list or armoured cars and tanks and how they work in the game. Appendix 3 has some optional rules, mostly for arsonists. Though there is a good section on civilian mobs. Appendix 4 has some complex templates which I would have to play test to see if they’re useful, they remind me of the old Laserburn templates in some ways (again a personal preference KISS and use the GW deviation dice and templates). Appendix 5 covers army morale, so you need be concerned about your overall casualties not just a unit’s casualties. Good idea. There are points values, but no army lists. There are plenty of these around (Mark Plant, Chris Peers to name but two), and plenty of books that give orbats. We couldnt see how we could add value in these. 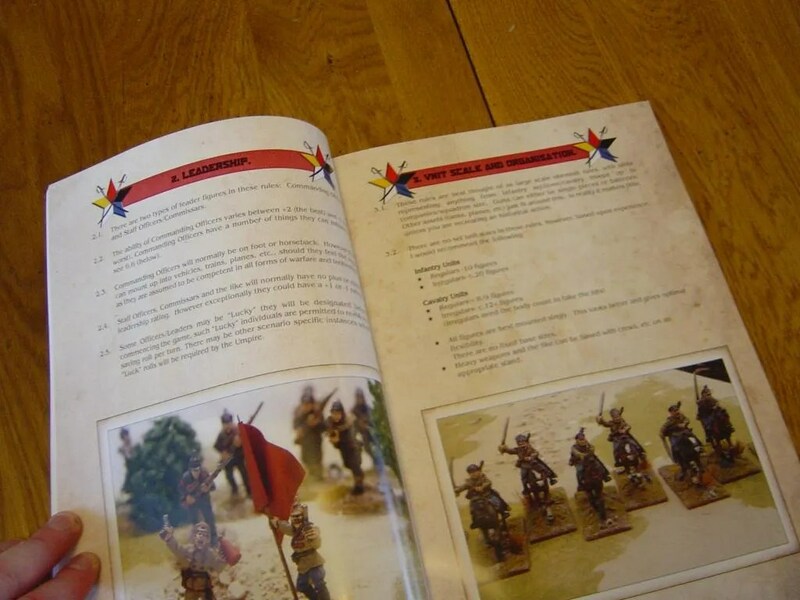 We will be including battle lists in the campaign book, due out next year . Overall it looks a good set of rules, and one I will enjoy play testing. Hopefully should there be any decent light in the next week I’ll post some pictures of play tests.